The second course, I’ll give semester is a general introduction to research practices in political science. I am not all that happy with the readings for the course, so if you have any advice for good introductory texts for first semester Bachelor students, it would be very much appreciated. The growing use of Twitter during election and issue campaigns by politicians, campaigners and the public alike has led to an ever increasing body of research on this topic. While a majority of studies focuses on political uses of Twitter in the USA, there is an ever growing literature on political uses of Twitter in other countries. Still, there remain challenges. Researchers from many different fields are addressing questions related to Twitter’s role in politics–such as political scientists, communication scholars or computer scientists. These researchers approach the topic from different perspectives with widely divergent methods and publish their results in venues of their various fields. This leads to a fragmentation of the field, with studies seldom addressing most of the available evidence. As of now, there is no coherent account of the existing literature. Such an account would enable researchers to develop hypotheses for their research based on empirical findings of past research. In the working paper Twitter in Politics: A Comprehensive Literature Review, I present an attempt at such an account. 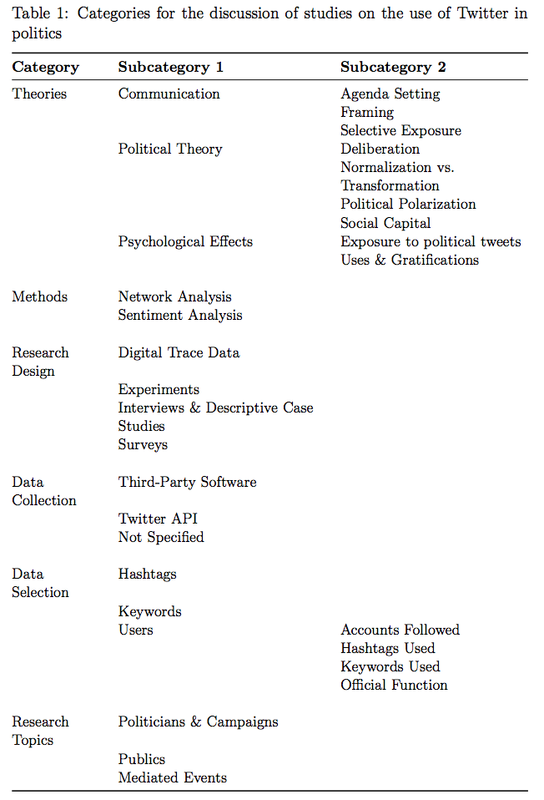 I will briefly present a large selection of studies addressing the use of Twitter by politicians, various publics during election and issue campaigns and reactions on Twitter by various actors to big mediated campaign events–such as televised candidate debates, party conventions or election day coverage. While an ever increasing number of studies addresses the role of Twitter in politics, this research is fragmented and, more often than not, only partially connected to available research on the same topic. This could be because the research area is rather new. So, as of now, there has not yet emerged a common canon of studies, identified as relevant by the community of researchers working on the topic. Also, scholars have spent little effort in systematically identifying common empirical patterns in various studies addressing the topic and thereby not provided the field with a list of phenomena and patterns that are to be expected when researching this topic. Another reason could be the diversity of the field. Researchers from many different scientific fields are working on the role of Twitter in politics. Political scientists, communication scholars and computer scientists have published on this topic. These publications come from different theoretical perspectives, use different methods and–probably most importantly–are published in different venues. These differences make it difficult for researchers to productively engage with relevant work in their area of interest stemming from other scientific backgrounds. This leads to a rich but only loosely interconnected body of evidence on the use of Twitter in politics. With this literature review, I wish to address this problem and to offer an account of the common findings and divergent evidence that can be found on the role of Twitter in politics if one pools the available research. In this literature review, I tried to include as many studies as possible that provided some empirical evidence on the use of Twitter in politics. In the selection of the studies, I consciously aimed to include all available studies that contained some empirical evidence on the topics of interest. In doing this, I did not just focus on studies published in scholarly journals, conference proceedings and books but also included–if available–unpublished manuscripts of conference talks or working papers. This increased the evidence available to be presented here. As this is a rather new research field, I thought it more beneficial for the goals of the study to include as much empirical evidence as possible without restricting myself to scholarly vetted publications. I will present studies included in this review with regard to their research questions, their research design, their mode of data collection, data selection and findings. I did not critique the studies included, be it with regard to their data collection, analytical approaches or the interpretation of their findings. Instead, my aim was to compile a collection of empirical evidence that might allow for the detection of patterns common across different studies and interesting observations, that were only evident in specific cases. While the selection criteria for the inclusion of studies in this review were rather broad with regard to the form of publication, I purposefully restricted the studies based on the topics addressed by them. 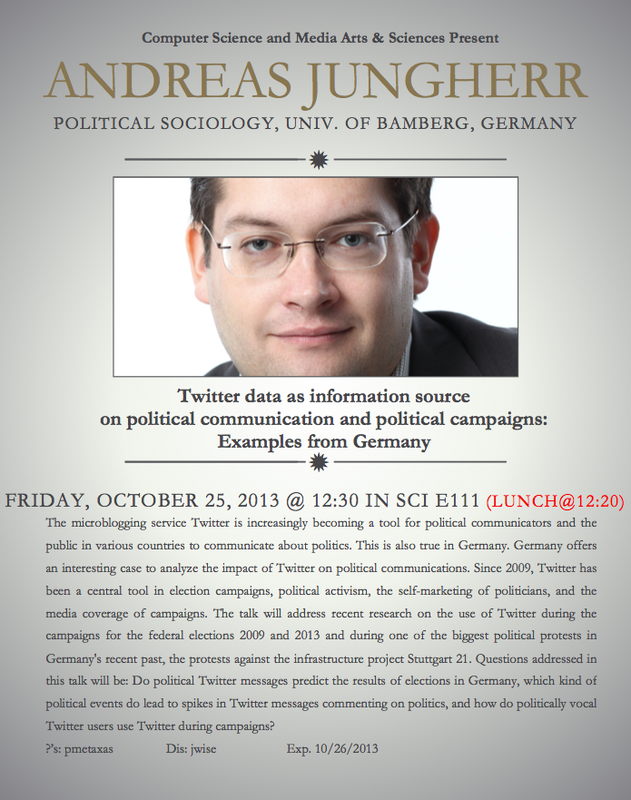 I only included studies that directly or indirectly spoke to the use of Twitter by politicians and campaigns, the use of Twitter by publics during election or issue campaigns and the use of Twitter by various users to comment on mediated campaign events–such as televised candidate debates, party conventions or election day coverage. I discussed the studies included in the review based on common features–be it the theoretical discourses addressed by them, the chosen research designs, approaches to data collection and selection on Twitter or their research questions. Table 1 shows the categories and subcategories that I used to group the studies. For each of this categories I presented a short discussion in which I emphasise common elements, divergent evidence and challenges for further research. I hope this literature review stands at the beginning of a more systematic approach to the discussion of uses of Twitter in politics. Please let me know what you think. Andreas Jungherr. 2014. Twitter in Politics: A Comprehensive Literature Review. Working Paper (February 27, 2014). Available from Social Science Research Network (SSRN). Ich freue mich sehr, dass mich die Organisatoren der diesjährigen reCampaign zu einem Workshop über die Nutzung von Twitter durch politische Aktivisten eingeladen haben. Der Workshop findet am 24. März ab 16:30 in den Räumen der Heinrich Böll Stiftung in Berlin statt. Mein Impulsvortrag wird wesentlich auf den Ergebnissen eines Artikels basieren, in dem ich zusammen mit Pascal Jürgens die Twitternutzung durch Aktivisten während der Proteste gegen Stuttgart 21 untersuchte. Hier das Abstract des Workshops und einen Link zu dem Artikel. Twitter ist zu einem Standard-Element im Werkzeugkasten politischer Aktivisten und Aktivistinnen geworden. Allerdings werden die tatsächlichen Funktionen des Dienstes für politischen Aktivismus selten diskutiert. Dieser Workshop wird einige dieser Funktionen am Beispiel der Proteste gegen Stuttgart 21 diskutieren. Wichtig ist hierbei zwischen Potentialen von Twitter für die Dokumentation, Koordination und taktischen Durchführung von Protesten und den Potentialen für die symbolische Sichtbarmachung von Unterstützung für die Anliegen von Aktivisten zu unterscheiden. Beides wir im Fall von Stuttgart 21 deutlich. Zusätzlich soll in dem Workshop diskutiert werden, ob es Kampagnen gibt, die sich für die Unterstützung durch Twitter besonders anbieten und wie sich Twitter in die Arbeit von NGOs einbinden lässt. Andreas Jungherr und Pascal Jürgens. 2013. “Through a glass, darkly: tactical support and symbolic association in Twitter messages commenting on Stuttgart 21.” Social Science Computer Review (Online First). In einem Interview mit Cicero Online habe ich heute noch einmal über die Rolle des Internets in deutschen Wahlkämpfen gesprochen. Die öffentliche Debatte über die Rolle des Internets ist in Deutschland noch immer viel zu provinziell. Auf der einen Seite haben wir Berater, die das Thema hochjubeln und übersteigerte Erwartungen wecken, auf der anderen Seite Journalisten, die es kaputtschreiben. Beide Gruppen schauen auf die USA und sind enttäuscht, wenn ihre Wahrnehmung der Rolle des Internets im US-Wahlkampf so in Deutschland nicht umgesetzt wird. Dadurch vernachlässigen wir in der öffentlichen Diskussion leider die tatsächlichen Funktionen, die das Internet für Parteien und Kandidaten in Deutschland erfüllt. (…) hierzulande verlässt man sich im Online-Wahlkampf noch zu sehr auf anekdotisches Expertenwissen. Die Amerikaner versuchen sehr viel stärker, entscheidende Elemente der Kampagnenführung messbar zu machen. Sie probieren viel mehr aus, beobachten genau, welche Methoden funktionieren und passen sich dann an. Dieses datengestützte, analytische Vorgehen könnte man auch in Deutschland mit großem Gewinn umsetzen. Andreas Jungherr im Interview mit Merle Schmalenbach: Wahlkampf Online: Die Wahl wird nicht im Internet entschieden. CICERO Online. 20/09/2013. 3. Die symbolische Sichtbarmachung von politischer Unterstützung und des Momentums von Kampagnen und die damit verbundene Möglichkeit, darauf folgender Berichterstattung traditioneller Medien. Die Potentiale dieser Funktionsweisen sind jeweils abhängig von den spezifischen politischen, rechtlichen, kulturellen und historischen Kontexten in denen Kampagnen und Kandidaten agieren. Sie können sich je nach Kandidat, Partei oder Land unterscheiden. In dem vorliegenden Artikel werden diese Funktionen des Internets für politische Kampagnen an den Beispielen der Präsidentschaftskampagnen Barack Obamas und deutscher Wahlkämpfe diskutiert. Andreas Jungherr. 2013. 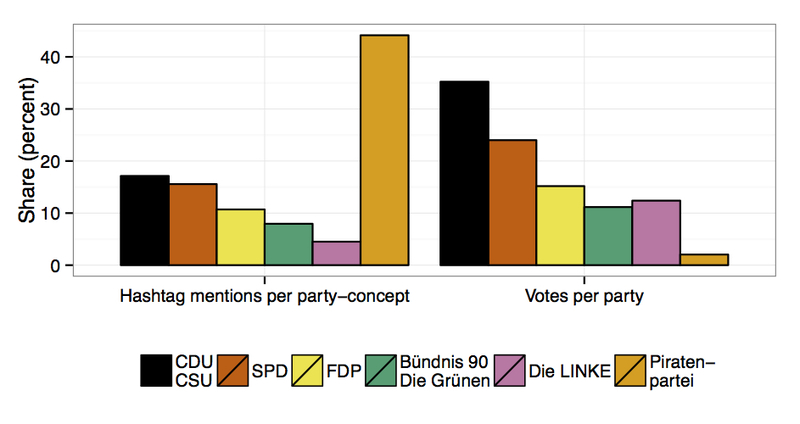 “Die Rolle des Internets in deutschen Wahlkämpfen.” Zeitschrift für Politikberatung 2/2013. S.91-95. Researchers increasingly test data documenting user’s behaviour on social media channels for their predictive power of social phenomena. In the upcoming edition of Internet Research Pascal Jürgens and I have and article that discusses general questions regarding the analysis of social phenomena with social media and that offers a specific approach to analyse social media data streams to detect anomalies in user behaviour that might offer clues about relevant offline events. I can only link to a gated version of the article. Still, if you do not have access to the publication but want to read the article, please drop me an e-mail. Andreas Jungherr and Pascal Jürgens. 2013. “Forecasting the pulse: how deviations from regular patterns in online data can identify offline phenomena.” Internet Research 23(5). Purpose – The steady increase of data on human behavior collected online holds significant research potential for social scientists. We add to this research by a systematic discussion of different online services, their data generating processes, the offline phenomena connected to these data, and by demonstrating, in a proof of concept, a new approach for the detection of extraordinary offline phenomena by the analysis of online data. Design/methodology/approach – To detect traces of extraordinary offline phenomena in online data, we determine the normal state of the respective communication environment by measuring the regular dynamics of specific variables in data documenting user behavior online. In our proof of concept, we do so by concentrating on the diversity of hashtags used on Twitter during a given time span. We then use the seasonal trend decomposition procedure based on loess (STL) to determine large deviations between the state of the system as forecasted by our model and the empirical data. We take these deviations as indicators for extraordinary events, which led users to deviate from their regular usage patterns. Findings – We show in our proof of concept that this method is able to detect deviations in the data and that these deviations are clearly linked to changes in user behavior triggered by offline events. Originality/value – This paper adds to the literature on the link between online data and offline phenomena. It proposes a new theoretical approach to the empirical analysis of online data as indicators of offline phenomena. The paper will be of interest to social scientists and computer scientists working in the field.